Both Banner Saga games are free to Twitch Prime members, now through the month of June. They tell the story of a band of refugees traveling through a land inspired by Norse myth, and combine turn-based tactics with modern Oregon Trail-style journey mechanics. 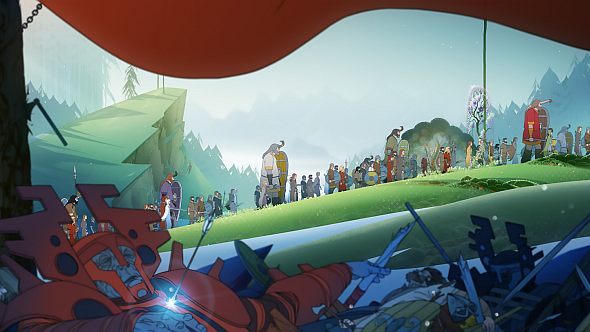 The Banner Saga debuted in early 2014, and has a beautiful hand animated art style accompanied by a haunting instrumental soundtrack. Battles pit your characters – a band of humans and horned giants called varl – against massive mechanical constructs known as the Dredge. But throughout both games, you find that the decisions you make during your travels, about when to buy food and how to deal with crisis, have just as much of an impact on your survival as your tactical sense. Not a member? Don’t worry. Here’s our list of the best free games on PC. Also included in this month’s Twitch Prime benefits are retro roguelike shooter Strafe, the gravity-defying arcade tank battler Treadnauts, and a puzzle game called Tumblestone that allows you to play as a sausage. As usual, the Twitch-Amazon partnership is offering a respectable slate of free games this month, and the two Banner Saga games alone make it well worth the price of admission. If you’re an Amazon Prime member, signing up for Twitch Prime is as simple as linking your accounts, which you can do by heading over to Twitch and hitting the Enable Twitch Prime button. There’s a new batch of free games included with membership every month, and past months’ offerings have included SteamWorld Heist, Superhot, Tales from the Borderlands.